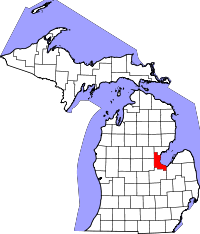 Bay County, so named for its location in the heart of the Saginaw Bay of Lake Huron, has birth and death records from 1867 to the present, and marriage records from 1857 to the present. Research hours are from 2:00PM until 4:00PM weekdays only, and certified copies cost $14 each. In addition to the County Clerk, the Bay County Genealogy Society, a society of volunteer researchers, offers a number of resources for researching genealogy and vital records. The Society also connects users to paid researchers who can be retained for various projects. Volunteers visit the Wirt Library at 500 Center Ave in Bay City, MI., three times a week to assist researchers. Bay City, the county seat, is a major port for Saginaw Bay, and the county's population has grown as a result with over 105,000 people residing there in 2010. Note: Documents sent for recording require a SASE for return.